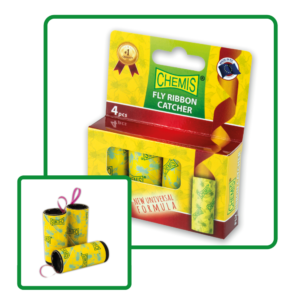 Fly paper Fly ribbon catcher is a product that has been known for nearly one hundred years and commonly used all over the world for capturing flies and other insects flying in residential, utility and other rooms. The product is in the form of a paper tape, covered with non-toxic glue without biocide substances. Fly glue trap with top luring efficiency intended to monitor insects in warehouses, food processing plants, stores, store warehouses, houses and utilities rooms.